QUESTION: I'M CONSIDERING PURCHASING A FUNCTIONAL KATANA. THE BLADES OF THE ONES I'VE BEEN ABLE TO HANDLE (27"-29") BIND WHEN DRAWN FROM THE SAYA AT A "WORN" POSITION. ARE MY ARMS TOO SHORT FOR A FULL SIZE BLADE? DO I NEED A SHORTER BLADE? IS THAT JUST THE WAY IT'S SUPPOSED TO BE? I DON'T WANT TO INVEST $$ ONLY TO BE DISAPPOINTED- PLEASE OFFER WHATEVER ADVISE YOU CAN. AND THANKS FOR SUCH AN INFORMATIVE SITE! Here's an easy way to get a rough idea of how long a Katana you should have. Get an extendable tape measure and hold it in your right hand, with your thumb extended down. Then relax your arm at your side and extend the tape until it nearly touches the ground and check the reading where your thumb touches the tape. This will give you a rough and ready idea of how long the blade will need to be. bern- 6' tall in the morning, somewhat shorter at night..............27"
gin- 5'3" all the time apparently.....any wakazashi............ah, ha, ha, ha! I have done this on a very informal basis but it really did help. Find the longest, heaviest rod you can ~still barely~ handle ~somewhat~ like a sword. If you have time, make a "pretend" saya for it. If not, use the web of your index and thumb as a pretend ~koiguichi~. Practice your kata with it. Or heck, just keep swinging it! Do this for a concentrated time every day. After perhaps a week of this, ideally at least 2 weeks), take that 27" to 29" sword (which is significantly shorter and much more manuverable than that clumsy rod you've been practicing with), draw it, and notice the difference. You should feel much more capable; I don't ~think~ it'll "bind" anymore, because the heavy rod should have helped you adjust to this. So, assuming you feel nimbler with even the 29" then, the question you need to ask then is, do you need to feel even more "nimble" (that is, shorter blade length), and how much. Length of a katana shouldn't be TOO much of a problem unless your arms are incredibly tiny. If you are unsheathing it correctly, it wouldn't make much of a difference. After barely pushing the blade out of its sheath with your left thumb (Aprox. 1 inch), you pull the saya backward with your left hand and pull the blade with your right. Pulling the saya back while drawing the blade should give you the extra leverage to effectively pull your katana from its saya. Hope this helps! I myself use a katana with a 40 inch blade (measured from the habaki) and I stand 6 foot 1. I use it to practise Komei juku muso jikiden eishin ryu on a regular basis. Please everybody don't hesitate to challenge yourselves and move up to a bigger sword! There is table of your height and blade length. A fairly short katana I know of is the Warrior Chisa Katana it has a OA length of 36.22 in. Here is a short table with the recommendation. I have been looking for a Katana that i will be able to strap to my back. i know that some of these swords can be to long to do that, but a lot of the blades that i have found are 28 inches, and i do not know if that is short enough to be able to draw form my back. what is the right length for a sword that i am looking for?? If I Want To Buy My 12 Years Old Boy a Katana, What is The Legh That I Need? This post was quite helpful for me, not that I'm getting a katana, but I was trying to figure out what would be a good length for a blade for me. Thanks for the info guys I'm building a katana for my son out of wood. This will help me get an idea of how long his should be. I'm only doing this because he tried o make a paper and popsicles stick katana, and it's cool and all but it will break within the next month are two. Take a wooden yardstick. With the zero end touching your chest between your pectorals, extend both hands (fingertips pointing outward) down the yardstick making a triangle. Where your fingertips stop will mark the optimal length for draw, control, and dexterity. don't buy a kid a Katana, give him a stick, or a bokken, once he has matured enough and can weild the stick well (a little training, actually a LOT would help) then he can look at a sword. 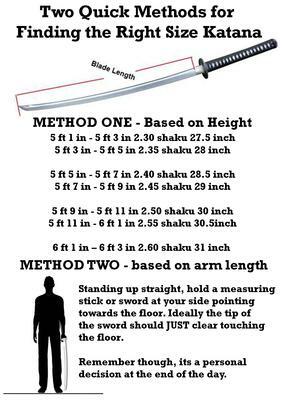 Re Sword length, go to a teacher, see what he says, be guided by that, but the side body measurement is quite good. For the Nimnos that say you should always move up to a longer sword, bull shite, again, go to a master, ask the question, listen to the answer. Got a sword at a gun Show. Well I myself got a katana at a gun show. The blade is 27 inches and the handle is 12 inches. I'm 5"5' and have no issues with drawing the blade. At first the sword was to heavy. But after a week of practice the blade felt like swinging around a pillow. Love the blade. Can't wait to get my second one this October. Sorry but most of you are wrong a katan length is measured buy how you can draw it from the saya. So you would stand string take a step forward with one foot and draw the sword the length of the blade needs to be the length of of your arm extended. All the big katana came after world war 2 when the Japanese sold to American market most Americans are tall so swords will be longer. But it's all based on that I'd get a wood sword and draw it from waist line mark where it is when arm is extended that's the size and it's not by you height it's you arm extension length. What is the deal with samurai swords being cut soo short that makers mark is gone ? At 5'1" most people are in agreement that a sword around 27" long would be best to suit your frame. You can also take a tape measure, drop your arm to one side and measure the distance from your hand to just above the floor and this will also give you a good measurement to go by. Hope this helps, but basically - a 27" blade would be best for you and they are fairly readily available. Im 5 foot 6 and I'm looking into a functional katana, but I'm not sure what length to buy. Im also quite petite which is why I think a smaller katana would be nice.